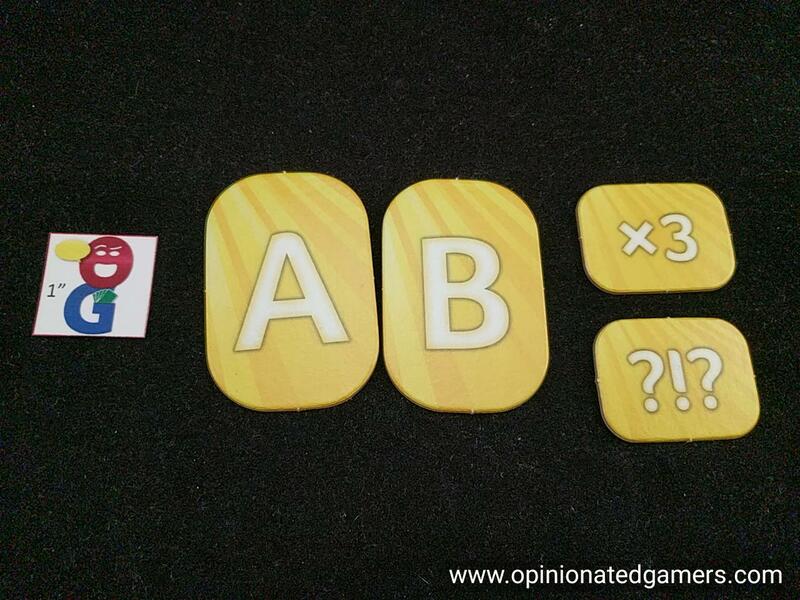 Dale Yu: Review of That’s A Question! The game board is placed on the table – make sure you have the side for the appropriate number of players. 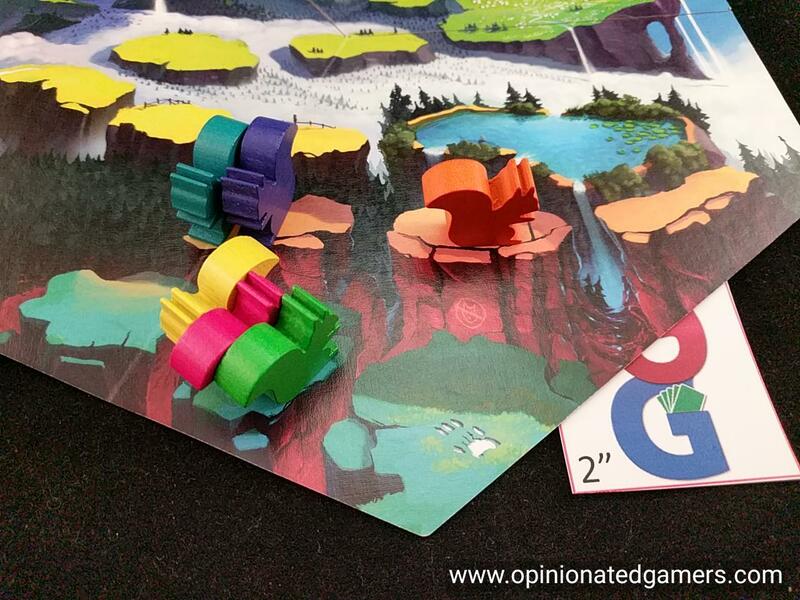 Each player takes all the components in his chosen color. The answer cards are shuffled, and each player gets dealt a hand of 5 cards. Then there is a draw pile created; the size is determined by the number of players. The question board is also placed on the table. It’s a weird throwing-star shaped thingy. A starting player is chosen. 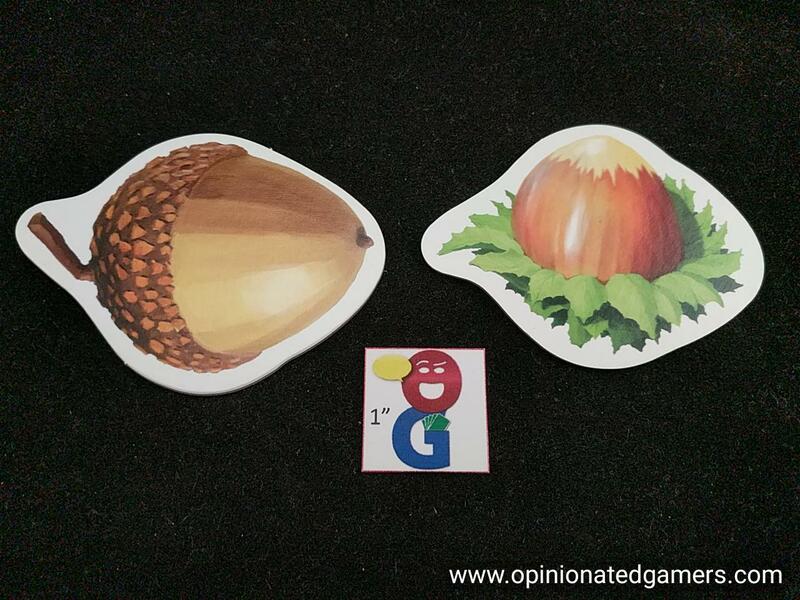 Everyone who is not the starting player gets an acorn token. Now, on a turn, the active player has to form a question and then ask one of the other players that question. There are three base questions on the board. GREEN: Which would you miss more if it ceased to exist? BLUE: Which of these would you choose? On your turn, devise a question. You must use the five cards in your hand, and you must match the color of the answers to the color of the question. 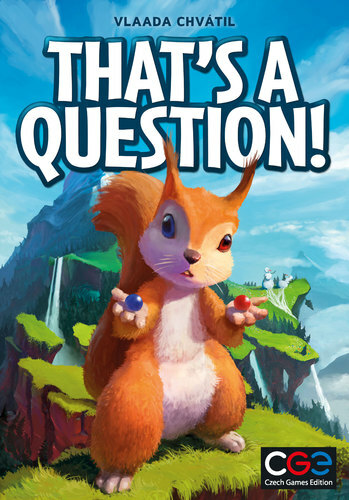 Then, ask the question to any other player who has at least one acorn. Immediately take the acorn token from them. The answerer must think about the question and then answer it. 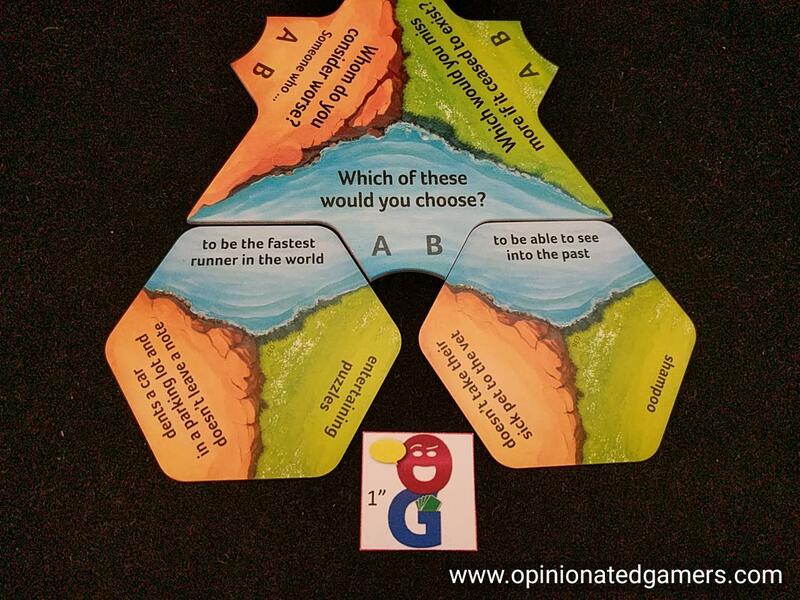 Each player has two answer tiles, labeled A and B. The one matching the answer is placed facedown on the table. While this is happening, everyone else other than the person who asked the question is a guesser. They are placing one of their answer tokens on the table trying to match the answerer’s token. The guessers may also choose to secretly play one of their kickers now. Remember, the asker is the only person who does not make a guess! When everyone has placed an answer token on the table, they are all revealed. All players whose token matches that of the answerer (and this includes the answerer) move forward one space on the scoring track. The asker moves forward one space for each incorrect answer. If a guesser played his “x3” kicker, he moves ahead three spaces if he matches the right answer. If a guesser played his “tough question” kicker, he moves one space for each OTHER player’s incorrect guess. These kickers are discarded on the board after they are played. However, if you look at the board, there are two areas (the lake and the meadow) along the trail. When your squirrel marker reaches each of these spaces, you take back any used kicker tokens at that time. You can then play then again! and he should start preparing his question now. When the last two cards are drawn from the draw pile, there is one more round in the game. 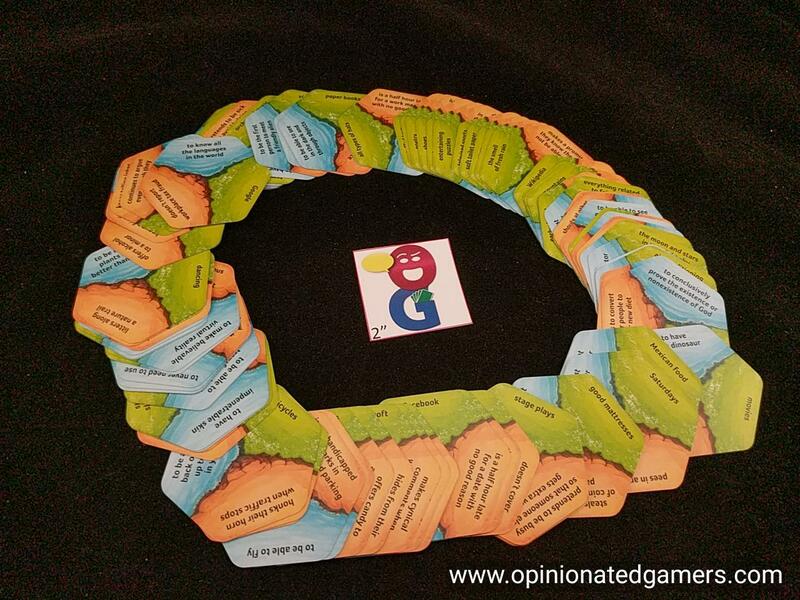 Each player will get one more turn to ask a question. At the end of that final round, whichever player is furthest along the track is the winner. There is no tiebreaker. 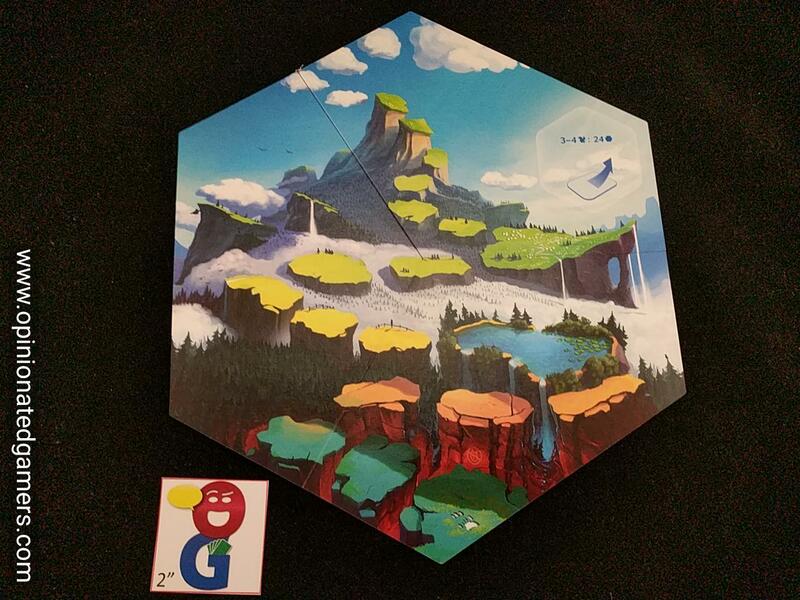 CGE continues to produce games of all sorts – hard to imagine that the people behind Through the Ages would also be making games like this. Of course, as usual, I also continue to be amazed at the breadth of game types that Vlaada is able to create. As far as the party games go, I’d prefer Codenames over this. Codenames Pictures would be on par with TAQ! And Pictomania would bring up the rear. All of these I’d play over Werewolf (just in case you forgot my preference on that). That’s A Question! is a great way to learn more about your friends. When playing the game, sure there is some advantage to pose a question to a particular person that you think you know the answer to. But, gamewise, this only helps if you can find a answer choice for the other side which the other players will guess at… because when you ask the question, you only score points for the missed answers from the other players! When playing for points, you have to figure out when to best use your kicker tiles. As you get them back twice in the game, you obviously want to play them in each segment – there is no penalty for using them and not scoring; so it’s just lost opportunity. Of course, the way that the scoring track is set up, it’s hard to know for sure when you’re going to cross a line – this may force you to use them on a question early in a scoring section – even if it’s an answer that you’re not very sure about. I have found that I score the most points when being asked a question, and since that’s something generally out of your control, you could end up passing through the reset threshold…. The rules are definitely CGE-quirky. But, for this sort of game/activity – it works fine. I even learned a few things such as the fact that squirrels (at least in some part of the world) eat hazelnuts. 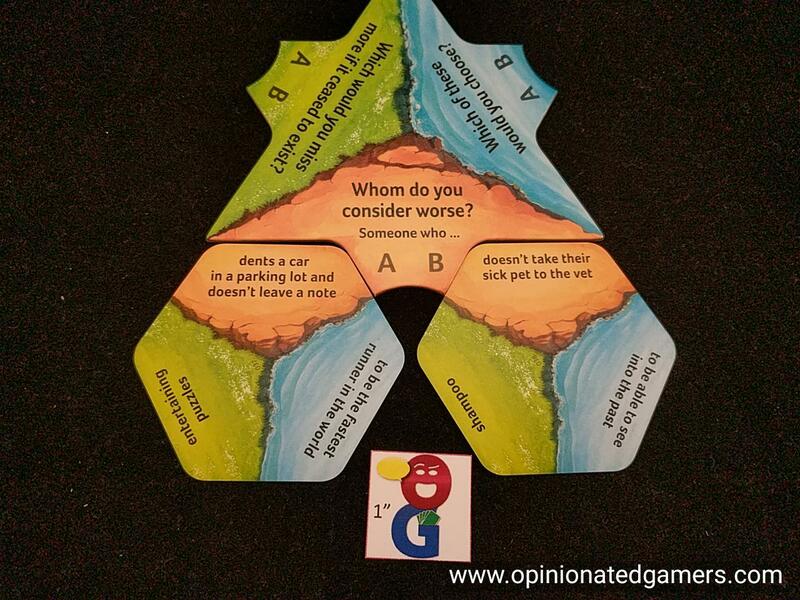 The question stems on the cards are quite varied, and there are plenty of thought provoking/hilarious/weird/whatever combinations that can arise when players pair the cards together. The acorn system works well enough to ensure that all players get asked questions on about an equal basis, though it might have been easier just to say you couldn’t ask a player in the lead. But, for me, it doesn’t matter because I’m less interested in the scoring here. The components are functional. 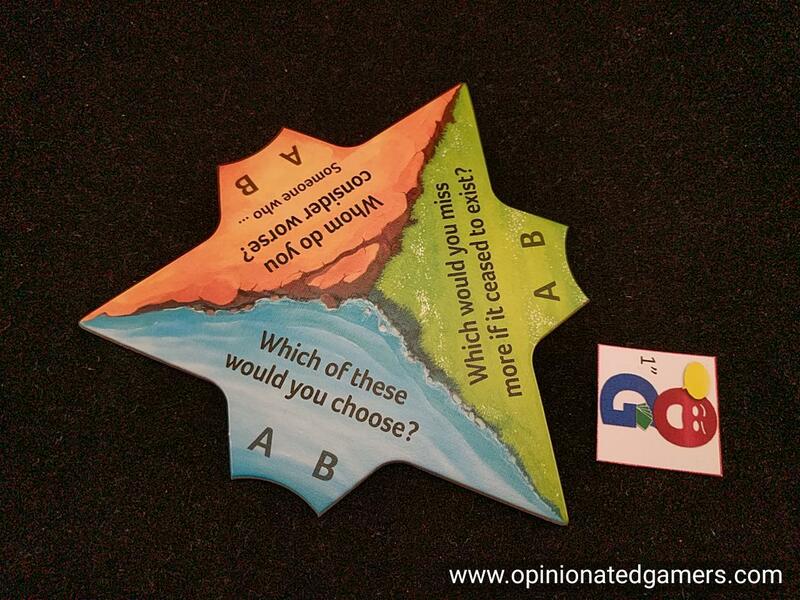 The cards are sturdy and the different colors of the questions keeps things from getting weird. I’ll say that I wish the board were larger – or maybe the wooden squirrels were smaller – as there is really not enough space to fit 5 or 6 of the squirrels on the spaces of the track. But, for this sort of game, it’s just about the questions on the cards. The colors on the cards are easy to identify and the text is easy to read. That’s pretty much all that matters here. That’s A Question! falls into the weird middle ground of possibly being a party game and/or possibly being an entertaining diversion – well, at least for me it does…. I feel the same way about Apples to Apples, Attribute, etc. I find that I enjoy asking and answering the questions here, and I love learning more about my gaming friends through their answers, but this isn’t the sort of thing that I care about winning or losing. I just enjoy the “doing” – and I would happily play this with any group of my friends that wanted a good laugh and to learn a bit more about each other. James Nathan: In Vlaada We Trust. Well, at least enough to try something the first time. When I first saw the premise for this game, I thought “That’s it? Well, it’s Vlaada, there must be some twist that I’m missing.” I’m not sure there was. I think this was too much player interaction for me :D. Specifically, I’m not especially comfortable with the game content verging this far outside of the gamescape and into real life. Karen M: This falls into the category of activity rather than game. It’s okay for a general game night. I think there is fun to be had if you adjust your expectations and if it’s the right group of people.